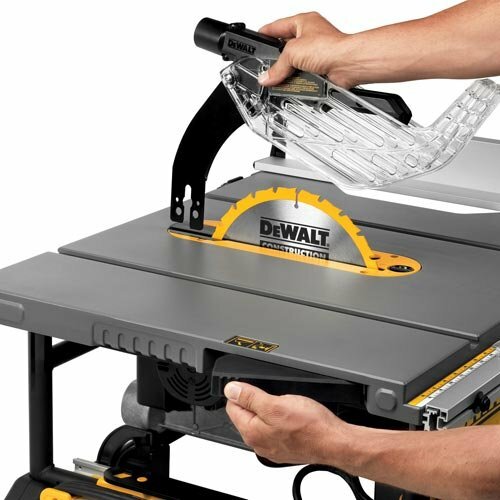 A good table saw is essential for any contractor or DIYer. With a table saw, you can cut boards to size, rip wood in half, and even do mitered bevel cuts. It’s important that you spend wisely on your table saw investment, so you get the most bang for your buck. In this review, we are taking a look at Dewalt’s 10” jobsite table saw, the DWE7491RS. One you unpack the contents, you’re ready to put it all together and get cutting! How Hard is the Dewalt DWE7491RS To Assemble? The DWE7491RS is simple to assemble and tune, and I was up and running within half an hour. The table saw’s instructions are simple and easy to read, and the assembly steps are quite easy. I was quite pleased with how accessible the different calibration and fine-tuning controls are on the DWE7491RS, even though I didn’t really need them. This saw was actually 100% calibrated and true right out of the box, something I rarely see! What Are the Best Features of the DWE7491RS? Perhaps the best feature I’ve seen in the DWE7491RS is the patented material support, which allows very narrow rip cuts. This is a nice feature that saves quite a bit of money on wasted material when I need to do narrow rips. The telescoping fence rails are also a good addition to this table saw, allowing a very compact table saw to handle material widths that other saws just can’t deal with. You can rip up to 32-1/2”, but the table is narrow enough for easy storage and transportation. This table saw features a 15-amp motor, which is more than enough raw power to cut through even some of the hardest of the hardwoods. The cutting depths are more than adequate for most needs, and the rolling stand is nice and solid, keeping the saw steady but still allowing you to move it around when you need to. The rolling stand is also a winner, in my book, since it’s oversized wheels allow you to maneuver steps and curbs with ease and without scraping up the finish on the stand. How Durable is the Dewalt DWE7491RS? The Dewalt DWE7491RS is as durable as a tank, from my experiences. Mine has dropped several times (I’m clumsy, what can I say?) and it keeps on ticking along without a hiccough. I find the steel construction a bit on the heavy side, but I’ll take it for the durability. The stand is also quite rugged, and able to handle quite a bit of abuse and use. Unfortunately, the finish on the cutting table is not very durable. A little bit of friction, and it rubs right off, leaving your tabletop looking used much sooner than you might like. Is the DWE7491RS Easy to Use? This table saw is a breeze to use. The large stop button is easy to knee or kick in an emergency situation, the fence rails adjust easily even with just one hand, and the flipover fence rail for narrow rip cuts is nothing short of brilliant. It cuts through just about anything you can throw at it like a hot knife through butter, even 4×4 cherry wood. The miter gauge on the DWE7491RS, like most miter gauges that are included with table saws, is close to useless. I quickly installed an after-market miter gauge, which is pretty much my standard anyways. It’s just unfortunate with a table saw at this price point that you have to do that. If you want to use dado inserts, none of the current dados on the market right now are exact fits, and tend to fit a bit loose. I use a combination of a dado insert and a zero clearance plate to make it work, but here’s hoping that Dewalt comes out with some accessories in the near future. As one final, minor gripe and warning: this saw will trip a 15-amp breaker if you are putting it under heavy usage. 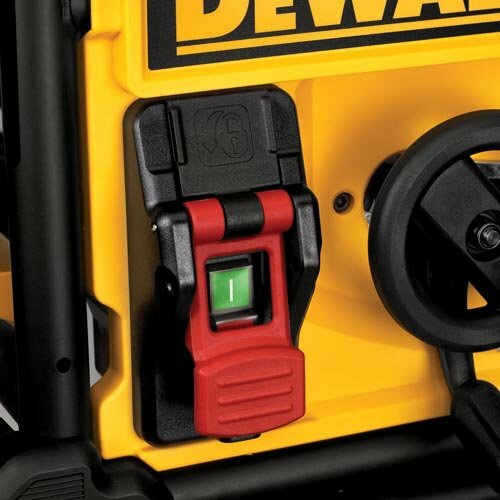 Even though the motor is rated at 15 amps, it will actually draw more than that with hard, thick wood stock, so you might want to be sure you either use a vacuum switch with a 15-amp fuse or operate the saw off a 20-amp circuit. I’m not even sure that should be a gripe, but it is frustrating when you have to run back in the house to flip the breaker back on in the middle of a cut! 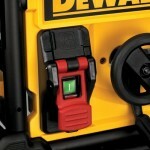 What’s the Warranty Like for the Dewalt DWE7491RS? Dewalt provides a 3-year limited manufacturer warranty, and they stand by their warranty. Their customer service staff are pretty easy to work with, but if you are one of the rare ones who have to get your saw repaired, be prepared to pay the shipping yourself. I’ve gone around and around with Dewalt on this one, and they just don’t budge. 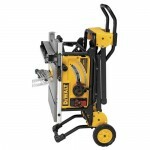 Dewalt has made a mighty fine jobsite table saw with the Dewalt DWE7491RS. It cuts through just about anything you can throw at it, and cuts with ease. It gets to looking used a bit too quickly for my liking, but that’s a cosmetic issue that does not have anything to do with what I bought this table saw for: to make rip cuts and help me do my home improvement and carpentry tasks quicker. For those tasks, the saw fits the bill perfectly. Take a look at Amazon.com’s price on the Rockwell RK7240.1 Table Saw if you’re interested. I completely agree about the miter gauge. Which aftermarket would you recommend?